Title NoteTitle based on the provenance of the records. Administrative/Biographical HistoryThe Gottfrieds were an extended family of Ashkenazi Jews who lived in Vienna from the late nineteenth century until the late 1930s, when most members fled. The family patriarch was Menachem Mendel Gottfried, whose son Salomon Gottfried was born in what was then Poland (now Ukraine) in 1872 and moved to Vienna sometime before 1899, when his eldest son Leopold was born. Two daughters, Frieda and Sabine, followed. The documents in this collection pertain mostly to Leopold, his wife Chaje, their children and their children's spouses. Leopold (b. 1899; d. 1972), a successful businessman later in life, served in the Austro-Hungarian army in the First World War and married Chaje Gerje (b. 1898 in Karaszynce, Poland; d. 1989) after his return to Vienna. They had three children (Manfred, b. 1922; Lori, b. 1923; Gerda, b. 1926). All three children were in school at the time of the Anschluss with Germany. Overtures were made to several countries before Leopold was finally successful in securing permission for his family to emigrate to Shanghai on board Conte Biancamano in January 1939. Shanghai, an open port at the time, was a popular destination for Jews fleeing Europe; at its height, the Jewish community in Shanghai exceeded 18,000. The Gottfrieds, like all Jews fleeing Nazi territory, were compelled to surrender virtually all their belongings and money before leaving Austria. Upon arriving in Shanghai the family spent some time in charitable accommodation before settling in a very cramped apartment in the Hongkew district. The children pursued technical education offered through ORT, the Jewish community association in Shanghai, and sought work in various trades serving the expatriate population of the city. Manfred, who spoke English fluently, found work with American car firm Dodge; Lori and Gerda worked as hairdressers. Leopold tried his hand at various jobs, eventually starting a small import-export business. All members of the family participated actively in the cultural life of Shanghai’s Jewish community. When the war ended, the family stayed in Shanghai rather than face the uncertainties of trying to relocate immediately. Living conditions improved somewhat, and Manfred (who by this time had become fluent in Mandarin and Shanghai dialect) found work with the US army as an interpreter; through this position he was able to secure employment for Leopold and others at US Army warehouses around Shanghai. During this time both daughters met their future husbands, who were also from Vienna. They married within a week of one another in 1947; Gerda to engineer Hans Kraus (b. 1919; d. 1987) and Lori to machinist Hugo Seemann (b. 1910; d. 1980). By 1947 the family had begun to consider permanently relocating in the face of uncertainty regarding the Chinese Civil War; in 1949, Shanghai became a possession of the newly-established People's Republic of China and lost its status as an open port. Pressure from the new administration made living in Shanghai untenable for most expatriates, who faced expulsion if they were unwilling to leave voluntarily. Members of the family approached many countries, including Paraguay and the United States, as possible destinations. Manfred, Leopold and Chaje immigrated to Vancouver in 1948 and encouraged the rest of the family to follow. Irma Kraus also immigrated to Vancouver. 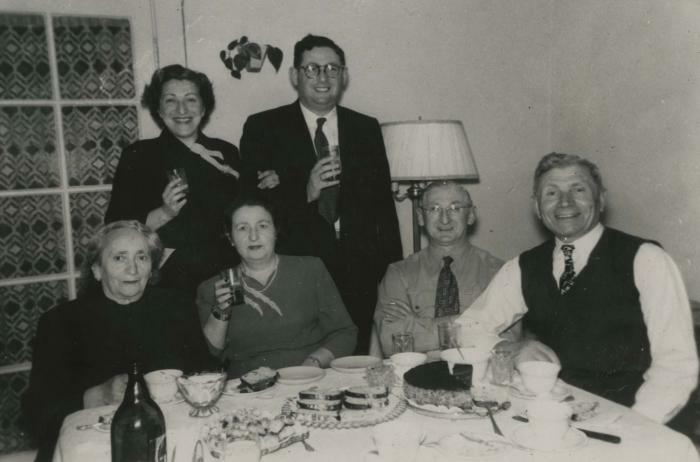 According to the travelogue kept by Hans Kraus, the rest of the family left Shanghai in January 1949 and traveled for the rest of the year, stopping in Israel and Vienna for about three months at a time before arriving in Vancouver in 1950, where they remained. Scope & ContentThe collection consists of vital records, administrative documents, trade certificates, travel papers, correspondence, letters of reference, liturgical materials, and photographs relating to the lives of members of the Gottfried family and the families of Gerda and Lori Gottfried's husbands (the Kraus and Seemann families, respectively). Records detail the vital statistics, career history, educational attainment, travels and emigration efforts of the family from the early twentieth century until the beginning of the twenty-first century. Collection has been arranged into the following series: Vienna ([189-]–1939), Shanghai (1939–1949), Emigration (1947–1950), Vancouver (1949–2000), Photographs ([191-]–[197-]). Archival HistoryRecords from the first and third accessions were maintained by Gerda Kraus (nee Gottfried) and her sister Lori Seemann (nee Gottfried) until at least 1999, when the first donations to VHEC occurred. Records from the second accession were discovered at a garage sale and donated by George Wendziak. The first group of records was donated by Gerda Gottfried Kraus in 1999. A further accession took place in 2000, when George Wendziak found a number of documents in a junk heap at a yard sale; realizing their value, he brought them to VHEC where they were identified and added to the collection. A final donation came in 2001 from the estate of Lori Gottfried Seemann. AccrualsFirst accrual donated by Gerda Gottfried Kraus in 1999. Second accrual donated by George Wendziak in 2000. Third accrual donated by Lori Gottfried Seemann in 2001. No further accruals are expected. NoteAudio donor interview with Gerta Gottfried is available in mp3 format. System of ArrangementItems were originally described exclusively at item level; the only information linking them to related records were the name(s) of donor(s). Arrangement was carried out in 2012 by the archivist. All materials were aggregated intellectually into the present collection; series were developed to reflect the functions and chronology of the records therein. Select items only have been input into Collective Access. Other items have been digitized and scans used to illustrate fonds, series and file-level descriptions. Consult the archivist for more information. Date of DescriptionArrangement and finding aid prepared by Myron Groover in April 2012. Updated with additions and item-level descriptions by Marisa Parker in March 2015. Minor edits made by Shyla Seller in 2016 in preparation for upload to Collective Access system. The collection consists of vital records, administrative documents, trade certificates, travel papers, correspondence, letters of reference, liturgical materials, and photographs relating to the lives of members of the Gottfried family and the families of Gerda and Lori Gottfried's husbands (the Kraus and Seemann families, respectively). Records detail the vital statistics, career history, educational attainment, travels and emigration efforts of the family from the early twentieth century until the beginning of the twenty-first century. Collection has been arranged into the following series: Vienna ([189-]–1939), Shanghai (1939–1949), Emigration (1947–1950), Vancouver (1949–2000), Photographs ([191-]–[197-]).